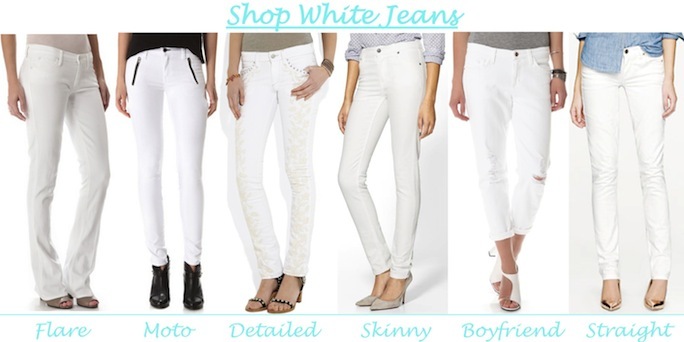 Summer is here and if you don't already have a pair of white jeans in your wardrobe rotation it is time to go shopping! 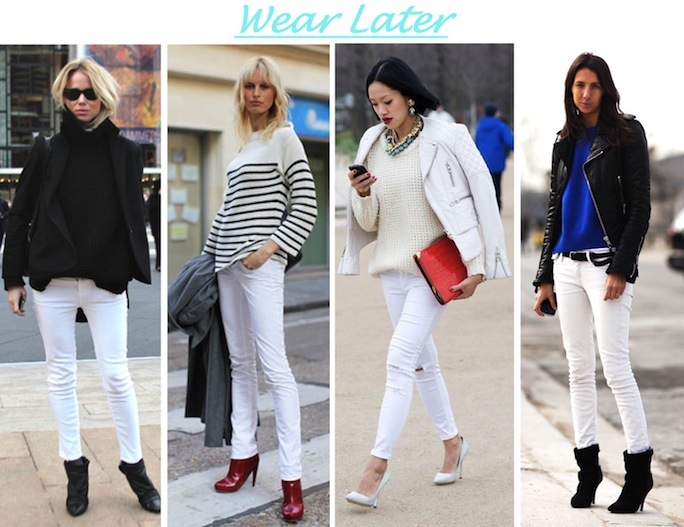 From classic boot cut to cropped and ripped, no matter how you cut them, bright white jeans are a must have. During warm seasons pair your white denim with light weight blouses or simple cotton t-shirts for a classic look. For work and dressier occasions white jeans with killer heels and a blazer do the trick. Fashion rules are made to be broken! Gone are the days that you will have to pack your white jeans away after labor day. During fall and winter pair crisp white denim with chunky knits and closed toed shoes for an unexpected but welcome look. They are also a perfect base for a winter white outfit. Besides it being the best season to find a wide selection of white jean styles, deal hunters can rejoice in tons of online sales at the moment (ShopBop and PiperLime are my favorite sites for sale denim at the moment). Remember when shopping to look for a denim that is thick enough you don't see every seam through it and unless you are model thin, I recommend buying a size up... trust me on this. I love white jeans... I have a distressed jbrand. The only drawback ... I wear them once and then I wash them. I feel like I practically live in my white jeans! Love this post! Yes yes yes! I love my white jeans for summer! Love the look but am so scared of spilling on them. White jeans are a 100% must for summer...as is a stain stick! White jeans always look good in summer! I am a fan of white denim for many summers!!! White jeans as these ladies demonstrate are chic and great for summer but knowing how clumsy I am, I will be scared to get one.